Make and search a database quickly. Compare many signatures and build a tree. The important concept here is that long k-mers are species specific. We’ll go into a bit more detail later. Computers love k-mers because there’s no ambiguity in matching them. You either have an exact match, or you don’t. And computers love that sort of thing! Basically, it’s really easy for a computer to tell if two reads share a k-mer, and it’s pretty easy for a computer to store all the k-mers that it sees in a pile of reads or in a genome. So, we’ve said long k-mers (say, k=31 or longer) are pretty species specific. Is that really true? 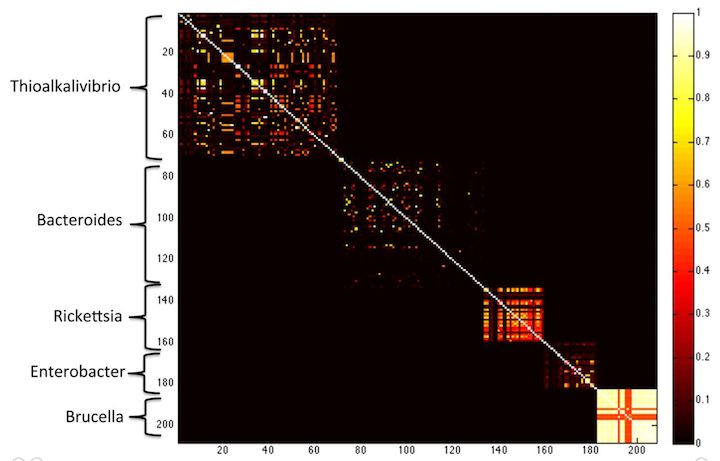 here, the Koslicki and Falush show that k-mer similarity works to group microbes by genus, at k=40. If you go longer (say k=50) then you get only very little similarity between different species. So, one thing you can do is use k-mers to compare genomes to genomes, or read data sets to read data sets: data sets that have a lot of similarity probably are similar or even the same genome. One metric you can use for this comparisons is the Jaccard distance, which is calculated by asking how many k-mers are shared between two samples vs how many k-mers in total are in the combined samples. A Jaccard distance of 1 means the samples are identical; a Jaccard distance of 0 means the samples are completely different. This is a great measure and it can be used to search databases and cluster unknown genomes and all sorts of other things! The only real problem with it is that there are a lot of k-mers in a genome – a 5 Mbp genome (like E. coli) has 5 m k-mers! About two years ago, Ondov et al. (2016) showed that MinHash approaches could be used to estimate Jaccard distance using only a small fraction (1 in 10,000 or so) of all the k-mers. The basic idea behind MinHash is that you pick a small subset of k-mers to look at, and you use those as a proxy for all the k-mers. 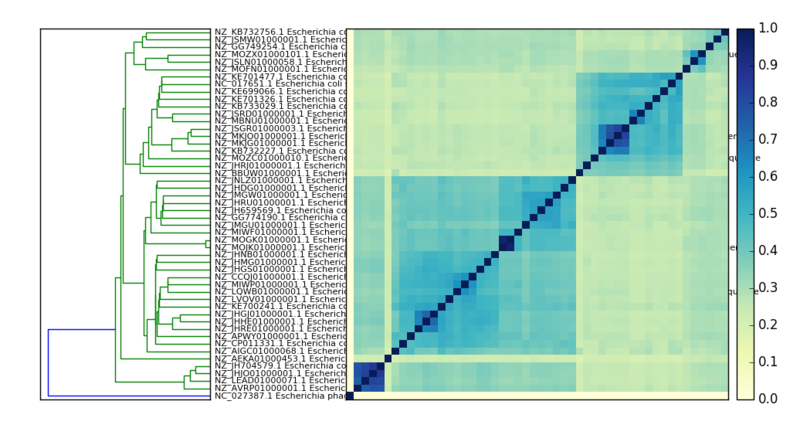 The trick is that you pick the k-mers randomly but consistently: so if a chosen k-mer is present in two data sets of interest, it will be picked in both. This is done using a clever trick that we can try to explain to you in class - but either way, trust us, it works! We have implemented a MinHash approach in our sourmash software, which can do some nice things with samples. We’ll show you some of these things next! Use case: how much of the read content is contained in the reference genome? Why are only 10% or so of our k-mers from the reads in the genome!? Any ideas? Try the reverse - why is it bigger? Suppose that we have a collection of signatures (made with sourmash compute as above) and we want to search it with our newly assembled genome (or the reads, even!). How would we do that? 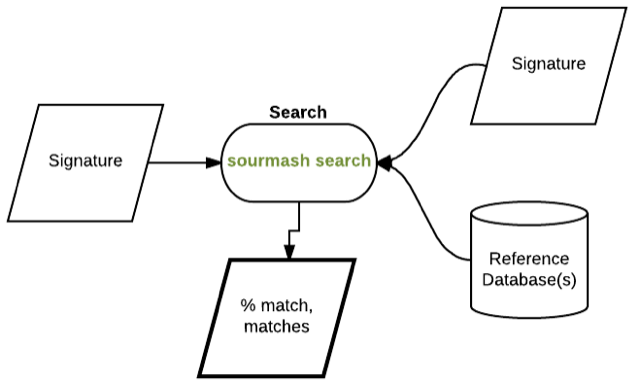 What does the database look like and how does the search work? One point to make with this is that the search can quickly narrow down which signatures match your query, without losing any matches. It’s a clever example of how computer scientists can actually make life better :). identifying what genome is in the signature. Some pretty good matches but nothing above %75. Why? What are some things we should think about when we’re doing taxonomic classification? which will produce a file ecoli_cmp.matrix.pdf and ecoli_cmp.dendro.pdf which you can then download via RStudio and view on your local computer. What does the little dot on the lower left mean? What is that and why is it occurring? This database is a GenBank index of all the microbial genomes – this one contains sketches of all 87,000 microbial genomes (including viral and fungal). See available sourmash databases for more information. After this database is unpacked, it produces a file genbank-k31.lca.json. In this case, the output is kind of boring because this is a single genome. But! You can use this on metagenomes (assembled and unassembled) as well; you’ve just got to make the signature files. To see this in action, here is gather running on a signature generated from some sequences that assemble (but don’t align to known genomes) from the Shakya et al. 2013 mock metagenome paper. 22.1% (2.8 Mbp) of hashes have no assignment. What do the columns here mean? Why might some of things in a metagenome be unassigned? It is straightforward to build your own databases for use with search and lca gather; this is of interest if you have dozens or hundreds of sequencing data sets in your group. Ping us if you want us to write that up. There are many tools like Kraken and Kaiju that can do taxonomic classification of individual reads from metagenomes; these seem to perform well (albeit with high false positive rates) in situations where you don’t necessarily have the genome sequences that are in the metagenome. 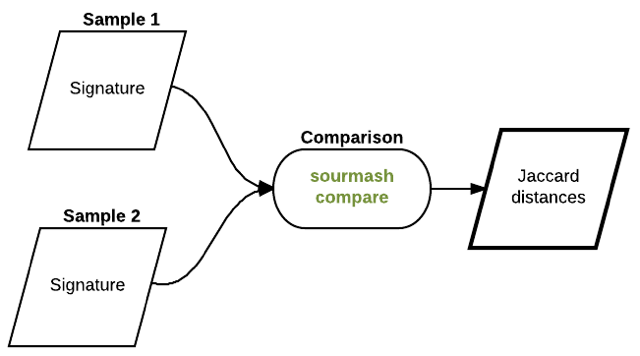 Sourmash, by contrast, can estimate which known genomes are actually present, so that you can extract them and map/align to them. It seems to have a very low false positive rate and is quite sensitive to strains. Chat with Phillip or Titus if you are interested in these use cases!